Hundreds of the mothers and children who fled persecution and violence in Honduras, El Salvador and Guatemala will spend this Mother’s Day in U.S. immigration detention. The Obama Administration has kept some of these families behind bars for nearly a year and in March the administration requested that Congress appropriate $345.3 million to fund a sharp increase in the number of mothers and children held in detention. The U.S. policy of detaining asylum seeking families with children is unjust and inconsistent with American ideals. This policy, designed to “send a message” to deter other asylum seekers from seeking U.S. protection, violates basic concepts of liberty and due process, as well as international human rights law. In June 2014 the Obama Administration announced its strategy for addressing an increase in families and children seeking refuge at the U.S. southern border. Part of this plan: detain and quickly deport families from El Salvador, Honduras, and Guatemala. 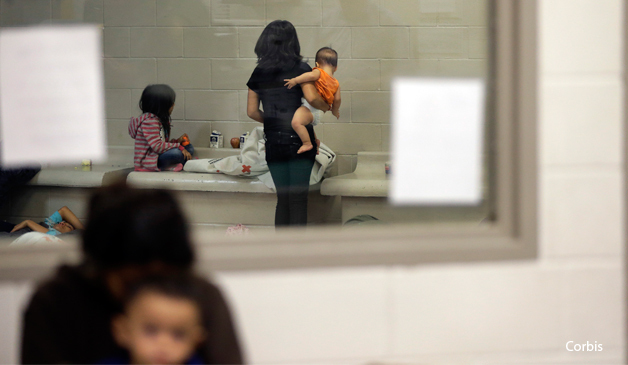 While immigration authorities had less than 100 beds for detaining families with children, they quickly launched efforts to increase that number—first with a makeshift facility in Artesia, New Mexico, then by converting a facility in Karnes County Texas, and more recently, opening a large facility in Dilley, Texas, slated to detain up to 2,400 children and their parents. All in all, the administration plans to increase family detention by 3,700% increase to 3800 detention beds. U.S. immigration authorities adopted the reasoning of former Attorney General John Ashcroft in the 2003 case Matter of D-J- to justify its decision to deny and oppose release from detention based on a desire to deter others from migrating. The administration continues to use this rationale to defend its months-long detention of mothers and children even when these asylum seekers were otherwise eligible for release on bond and presented no risk of flight based on their individual circumstances. The irony is that while countries around the world face staggering numbers of refugees, the numbers at the U.S. southern border are comparatively low. Moreover, as DHS Secretary Jeh Johnson confirmed in recent congressional testimony, “apprehensions are in fact at their lowest rate since the 1970s,” and “the number of unaccompanied children apprehended at the southern border, month-to-month, are the lowest it has been in several years” with the total number for the fiscal year so far at 43% less than at the same time last year. deference” to the decision of former Attorney General Ashcroft in Matter of D-J-. many of the nation’s leading law firms, added its voice by calling on the administration to end deterrence-based detention, pointing out in a September 2014 letter to Vice President Biden that the Ashcroft approach impedes access to legal counsel. As leaders across the nation called for a new approach, mothers held in the facility in Karnes County, Texas decided they needed to act. The week before Easter Sunday, these mothers launched a holy week hunger strike. In an open letter, the mothers wrote “[w]e have come to this country, with our children, seeking refugee status,” but “have been locked in this place for as long as 10 months,” and “are still detained because we are not able to pay the elevated bond and in some cases we are not given the opportunity to pay the bond.” On April 14, 2015, the Houston Chronicle reported that 10 mothers at the facility had launched a new partial hunger strike to protest the United States’ detention and high bond policies. The Obama Administration’s approach is out of step with the approach most supported by American voters. A recent poll, conducted by the Republican polling firm Public Opinion Strategies for Human Rights First, confirmed that the public supports the use of alternatives rather than detention. In a poll of voters in twenty-five of the most competitive congressional districts, as well as voters in South Carolina and New Hampshire, 62 percent said that rather than holding asylum seekers in jails and detention facilities, the United States should increase the use of alternatives to detention. More broadly, voters across nearly every major demographic, including party and ideological lines, believe the asylum and refugee system needs to be improved and strengthened to better protect refugees. For fiscal year 2016, DHS is slated to spend $345.3 million to fund the escalation of family detention. This amount is in addition to the roughly $2 billion already spent on immigration detention each year. As Alex Nowrasteh of the Cato Institute has pointed out, the Dilley facility, run by Corrections Corporation of America, will cost the U.S. government about $300 a day per person held in the facility —amounting to roughly $260 million each year. By contrast, community-based support programs and other alternative measures, proven to secure appearance for immigration hearings and deportation, are much more fiscally prudent, costing only 17 cents to $17 a person a day. These programs—which are effective and cost-efficient—enjoy support across the political spectrum. In addition, many of the women and children currently housed in U.S. immigration detention facilities have close family members in this country who are ready to take care of them. The U.S. Conference of Catholic Bishops and Lutheran Immigration and Refugee Services are also willing to run community-based appearance support programs that can help make sure families show up for hearings. It’s time for the Obama Administration to realign its immigration detention policies with American ideals and international law. That step will not only save taxpayer dollars, but it will reflect this nation’s long history of protecting those fleeing persecution and violence.